Have you read the news that apparently Millennials are killing just about every product category we’ve held sacred for decades? It would be easy to dismiss this phenomenon as just one more way the so-called “entitled generation” is changing society as we know it. But this would not only be a gross over-simplification, it misses the mark on a larger—and perhaps more important—theme: status quo doesn’t exist anymore, especially when it comes to your training programs. Even the most steadfast products and processes can become obsolete through a simple change in perspective. There are numerous articles that have been published on the subject, all providing slight variances on the Millennial “hit list.” Here is a quick summary. This disruption isn’t just limited to home goods. It can—and is—occurring in just about every industry, including education. As training professionals, how can you stay ahead of obsolescence? It’s not as daunting and terrifying as it sounds. And, it doesn’t require a complete overhaul of your current programs. Pretend you’re a new hire in your organization. Take inventory of every aspect of how you deliver your training programs—from how learners register for the class to how the educational material is delivered. As you do, ask yourself why you do it that way. Ask multiple levels of “why” if necessary, to get to the core reason. If you get stumped, don’t feel you have a solid answer, or if the answer doesn’t make logical sense after you really pick it apart, then this may be an area you want to address. If you can easily access a list of your young professional members or prospects, see if you can recruit them for a quick online panel discussion or survey. You can use more traditional tools such as SurveyMonkey, or you can do a group video chat using social media live video tools on Facebook, Snapchat or Houseparty for a virtual “face-to-face” topic discussion. Get their perspective on the process and see if there are any aspects of your programs they don’t understand, appreciate or value. Millennials are supposedly killing department stores because these stores don’t provide the shopping experience they want—hands-on and interactive. Guess what? This is their expectation for just about everything else they encounter—including education. How can associations provide this experience? For instance, can you deliver the same content in a way that supports a “show me, don’t tell me” model through hands-on applications instead of lectures? Training professionals have enough disruptors keeping them up at night, from gamification and mobile learning to program growth and success. 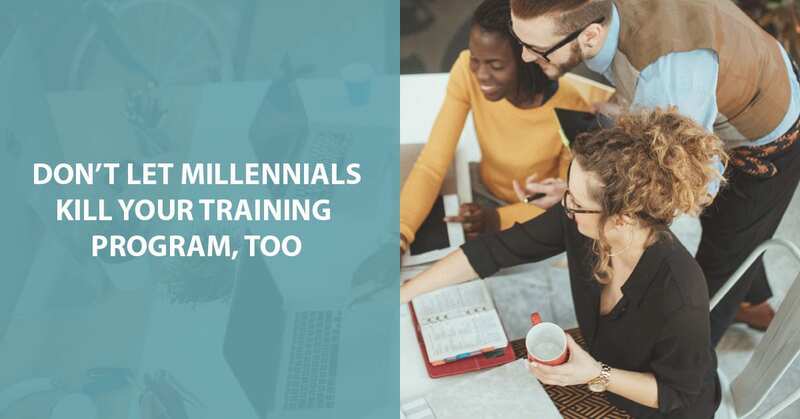 Thinking about how to completely overhaul your existing training programs to remain relevant doesn’t have to be one of them, because it doesn’t have to be an all-or-nothing approach. Sometimes the simplest changes are the ones that have the greatest impact. As the voice of your industry, associations provide tremendous value to members and learners. How this value is delivered, however, may need to change as the needs and preferences of your learners change. One of the easiest ways to keep evolving your training and education programs is to take a time-out now and again and challenge yourself to question old assumptions. You may find new—and even better—ways to deliver education.